Robert (Bob) St. Laurent resident of Manoir du Lac in McLennan passed away on September 15, 2018 at the age of 87 years of age. He was born at home in Girouxville, AB on July 28, 1931. Robert married Lucille Boucher on June 26, 1956, where they farmed and raised a family of five children in Jean Cote, AB. 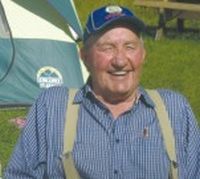 In 1972, Bob moved his family to Mackenzie, B.C. where he worked at a sawmill until retirement. Bob and Lucille moved back to the Smoky River area in 1992. Bob was all about family, spending weekends at home playing cards and board games. He spent a lot of time out in nature, camping, fishing, hunting, and gardening. Bob leaves to mourn his wife Lucille of 62 years; his children Angele (Ron) Cole of Chewtynd (B.C. ), Diane St. Laurent of Prince George ( B.C. ), Ronald (Tanya) St. Laurent of Kamloops (B.C. ), Hector St. Laurent of Vancouver (B.C.) and Gisele (Peter) DiIorio of Victoria (B.C. ); five grandchildren, and four great-grandchildren. At Robert’s request, there will be no formal funeral service.